This is 2-ply Jade Sapphire silk cashmere in colorway Autumn Sonata. The yarn was a gift and I want to make it into something extraordinary. I have one skein, which is about 400 yards. I think a scarf would be nice. 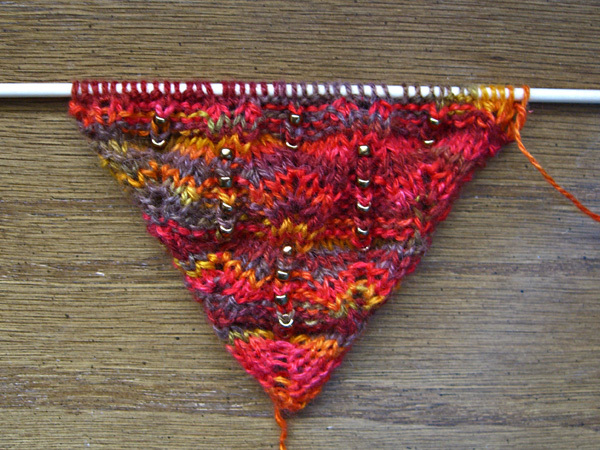 I want a leafy stitch pattern to fit into the autumnal theme. But I’m not sure I like this one even though I swatched it first and thought it would work great. I’m not sure that the leaves stand out enough as leaves, even with the bead stems. I’m thinking of frogging this and trying a different pattern. One where the leaves are differentiated by YOs, or something, so they stand out more. I do like the color of the beads, though, and want to work those in some way. What do you all out there think? To frog or not to frog?